You’re probably used to state-of-the-art pet care if you live in North America or the UK. But what level of care will be available in your new home? That depends on where you’re going, but chances are very good Walter will still be in very good hands. The past several years have seen a dramatic uptick in pet ownership, all around the world. As incomes have risen, dogs and cats have benefited as well, transitioning from difficult lives as unwanted strays (or even menu items) to happier positions as loved household pets. With that, protecting them from harm and keeping them healthy becomes a must. So demand for top quality veterinary care has risen as well. Will my new vet speak English? It’s important to be able to communicate clearly with Walter’s veterinarian. If you speak the language of your new country, that won’t be a problem. But English is widely spoken, even in countries where that might surprise you. And when it comes to vets, many receive their medical training in the UK or the US. Furthermore, just as you are about to become an expat in a foreign country, some American and British vets also choose to relocate and practice in some other country. So discussing Walter’s health in English may not be a concern. If you’re relocating for business, ask co-workers who have already made the move for recommendations. Look for country-specific online expat forums. These groups can be a gold mine of insider information to smooth almost every aspect of your move, including all things pet-related. Search online. 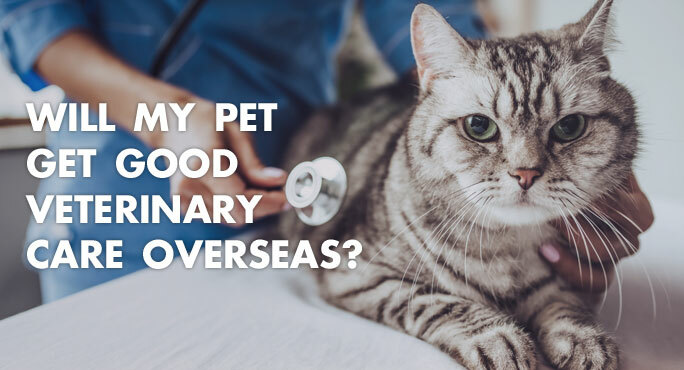 You can search for vets in your new country or town, but there may also be a local organization equivalent to the American Veterinary Medical Association or the American Animal Hospital Association. These professional associations usually membership directories. Your current vet might even know someone. Just like making a list of everything you need to do to prepare Walter for his overseas move, making a list of questions for potential new vets will ensure you don’t overlook something important. As you do your research, make notes of the answers you’re able to find. It’s possible you’ll have to ask some or most of these questions in person, but getting advance info will give you a better picture of the local veterinary picture where you’re moving. How many veterinarians and technicians does the clinic have? What are their credentials? Are any of them specialists? Do they speak English? What hours is the practice open? What if your pet has an after-hours emergency? What diagnostic tests are they able to perform onsite? Do they routinely perform annual wellness checks, and if so, what does that include? What are their fees and payment options? You’ll find that veterinary practices in other countries typically offer a broader range of non-medical services, which can make it easier to secure the supplies and accessories Walter will need and want. Your new vet’s office might include a well-stocked store, salon/grooming services, and even offer boarding for Walter should you have to travel without him. Walter’s passport – the assemblage of documents needed for him to enter your new country – will include essential information about vaccination types and dates. But your new vet will need to know his entire medical history in order to provide the best possible care. Request copies you can pack in your luggage, so you’ll have them at hand when you’re ready to make that first appointment for Walter.